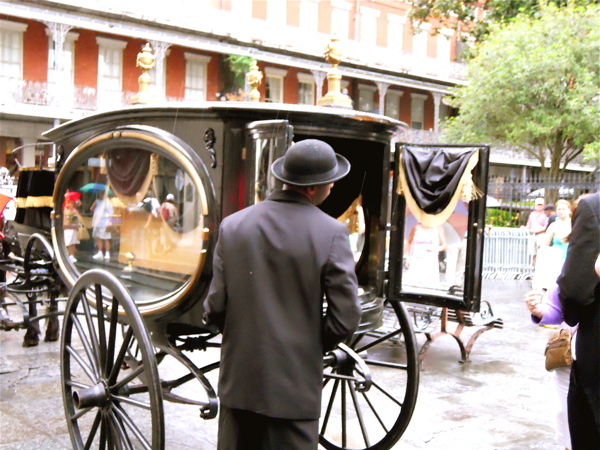 A horse-drawn hearse delivers Katrina’s remains to her final resting place. On a rainy Sunday afternoon, the mood was light in Jackson Square. It was Hurricane Katrina’s big five year anniversary, and while at several churches somber words ruled the day, here in the French Quarter it was a different scene, as singing, cheering and dancing were on display. I was already in a reflective mood about Katrina – how life had changed during and after the storm, and where New Orleans, and the country stood five years later. The last thing I needed was a deeply depressing church service, or another soon-to-be corrupt public official chattering on about our indomitable character and ringing some bell. Besides there are thousands of people in New Orleans who lost everything, and those more severe anniversary events are a sacred moment where people can go who are still mourning. I was looking for something a bit more uplifting and loose. It was a gloomy day already and somber events could push the day into the depressing, so I opted to attend a jazz funeral for my old girl Katrina – metaphorically speaking of course. 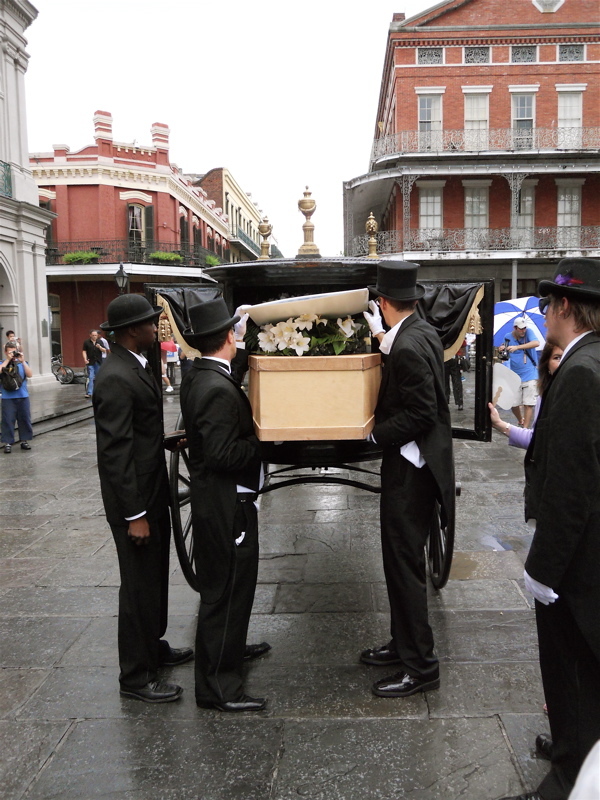 Pallbearers remove Katrina from her hearse. For those not familiar with such events allow me to explain. Instead of your typical funeral, where there’s a viewing, crying, hugging and hushed tones, here in New Orleans they celebrate the life of a person. You place the deceased in a hearse, in this case horse drawn, assemble all family, friends and well wishers, get yourself a jazz band and take that party into the streets. This is called a “second line.” It’s essentially a parade with all your well wishers, but it’s more than that. There’s a leader out front, usually with an umbrella, pumping it up and down, dipping the second line dance and keeping everything funky. The brass band is blowing, people are spinning and dancing, and folks are sharing a drink in the deceased’s remembrance. It’s a beautiful and holy tradition in New Orleans. This second line began at the historic Hotel Monteleone, http://hotelmonteleone.com, located at 214 Royal Street, particularly well known for its rotating Carousel Bar, which I swear seems to speed up after a few stiff cocktails. The funeral then wound its way through the Quarter, picking up wide-eyed tourists along the way – they’re curiosity piqued by the revelry on display. The Jaywalkers Second-Line Jazz Band kicked the sound up a notch as our happy procession of mourners arrived at St. Louis Cathedral in Jackson Square – the final resting place for Katrina on this day. We shared a big gospel tune to close the festivities and then a cheer went up around the Quarter. Items hoped to be forgotten were placed into Katrina’s casket. The driver of the hearse hopped down, and Katrina’s pollbearers joined him in a gothic display worthy of any Anne Rice vampire novel. They extracted the faux-coffin of our nemesis and placed it onto the ground. Contained inside was an eclectic mix of memorabilia from the days of Katrina, including bleach (from cleaning out nasty refrigerators), a tarp (to cover those holes in your roof), and MREs (Meals, Ready to Eat, that many subsisted on for months), along with a BP tool box foreshadowing the current oil spill disaster in the Gulf of Mexico. 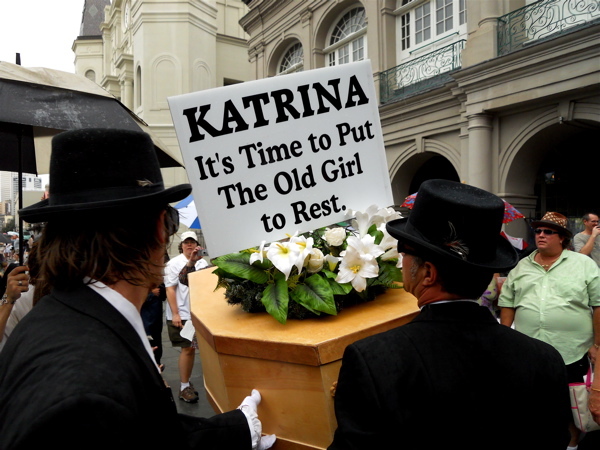 The ushers popped the lid on Katrina’s coffin and asked the assembled crowd if anyone had other items to add to the contents, to which a woman removed her veiled-hat and black gloves to be included. 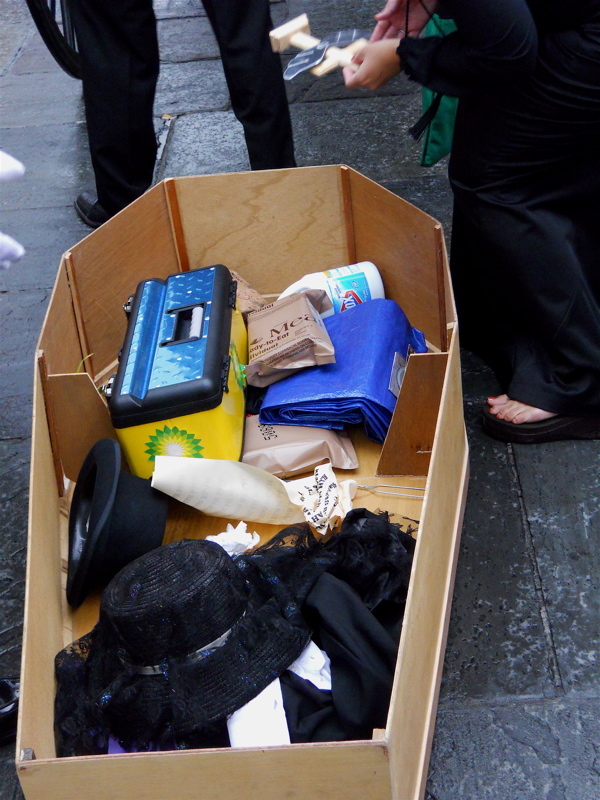 The lid was replaced and the coffin was taken into the cathedral for an interfaith memorial service. Katrina only lasted a day, but her impact is five years strong, with every indication we’ll be back here for several anniversaries to come. That’s a big life to celebrate – worthy of several drinks to dull the pain. Katrina on her way into St. Louis Cathedral in Jackson Square. This entry was posted in Events, News, Travel and tagged French Quarter, Hurricane Katrina, Jackson Square, Jazz Funeral, Katrina, New Orleans. Bookmark the permalink.